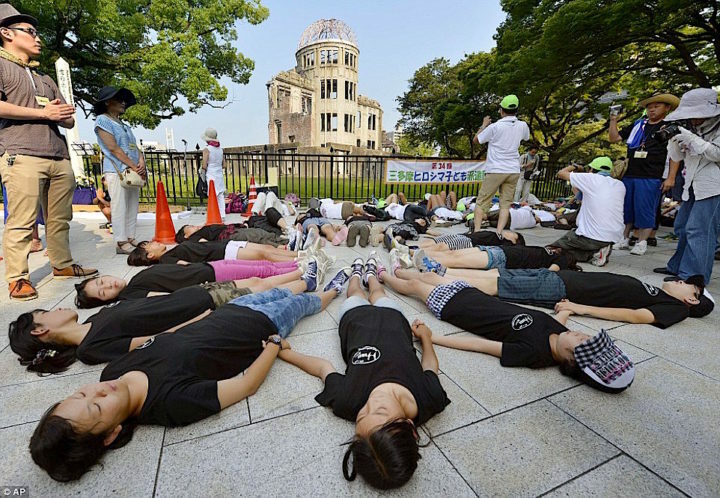 President Obama’s visit to Hiroshima has been the subject of much commentary and debate. Peace activists, scientists and even the New York Times called on Obama to use the occasion to announce meaningful steps toward worldwide nuclear disarmament, as he famously promised before receiving his premature Nobel Peace Prize. Certainly not if Obama hands the next administration his initiative to “modernize” the entire U.S. nuclear arsenal. That is a 30-year program estimated to cost One Trillion Dollars, or $1,000,000,000,000,000. Smaller, more precise and “usable” nukes would be in the mix. There are other bad signs. Standing next to Obama at Hiroshima was Japanese Prime Minister Shinzo Abe who is shredding Article 9 of the Japanese constitution, the “pacifist” clause that bars Japan from sending troops abroad or engaging in war. The alarmingly militaristic Abe has even hinted that Japan itself should become a nuclear power. The Obama administration is encouraging Japan to have a more aggressive military posture, as part of a U.S. backed regional response to China’s assertion of primacy in the South China Sea. That is also the context for Obama’s announcement that he is lifting the U.S. embargo of weapons sales to Vietnam. The U.S. “normalizes” relations by selling weapons of war. The so-called Asia Pivot, which would see 60% of U.S. military forces stationed in the Pacific, is only one current assertion of U.S. global hegemony. The U.S. is involved in multiple wars in the Middle East, it continues its longest war in Afghanistan, and it is pushing NATO, including Germany, to station significant military forces on Russia’s borders. The U.S. nuclear bombings of Hiroshima and Nagasaki, which killed 200,000 civilians, were inexcusable and morally reprehensible, especially since, according to many U.S. military leaders, they were absolutely unnecessary, as the Japanese were already defeated and were looking for a way to surrender. U.S. presidents may never apologize for what our country did at Hiroshima and Nagasaki. But we do. Veterans For Peace expresses our deepest condolences to all those who were killed and maimed, and to their families. We apologize to the Hibakusha, the survivors of the nuclear bombings, and we thank them for their courageous, continuing witness. We apologize to all the Japanese people and to all the people of the world. This hugely atrocious crime against humanity should never have happened. As military veterans who have come to see the tragic futility of war, we promise that we will continue working for peace and disarmament. We want to see nuclear disarmament in our lifetime. It is a miracle that that there have been no nuclear wars since the U.S. bombings of Hiroshima and Nagasaki. We now know that the world has been close to nuclear annihilation on several occasions. The Nuclear Non-Proliferation Treaty calls on the nuclear powers (nine nations and growing), to negotiate in good faith to reduce and eventually eliminate all nuclear weapons. Nothing of the sort is taking place. The aggressive U.S. military posture, including its development of new nuclear weapons, has prompted China and Russia to respond in kind. China will soon be launching nuclear-armed submarines to cruise the Pacific Ocean. Russia, threatened by the placement of “defensive” U.S. missile systems near its borders, is upgrading its nuclear capacities, and is touting new submarine-fired nuclear-armed cruise missiles. U.S. and Russian missiles remain on a hair-trigger alert. The U.S. reserves the right to a first strike. India and Pakistan continue to test nuclear weapons and to fight over the territory of Kashmir, constantly risking the possibility of a greater war in which nuclear weapons might be used. North Korea, threatened by the presence of nuclear weapons on U.S. Navy ships, and by the refusal of the U.S. to negotiate an end to the Korean War, brandishes its own nuclear weapons. Israel has as many as 200 nuclear weapons with which they intend to maintain their dominance in the Middle East. The possession of nuclear weapons earned the former colonial powers Britain and France their seats at the UN Security Council. Iran does not have nuclear weapons, was not even close to acquiring them, and they claim they do not want them. But one could certainly understand if they and other countries who feel threatened by nuclear powers might want to acquire the ultimate deterrent. If Saddam Hussein had actually had nuclear weapons, the U.S. would not have invaded Iraq. There is a very real possibility that nuclear weapons could fall into the hands of terrorist organizations, or just be inherited by governments that are more militarist than the last. In short, the danger of nuclear war, or even multiple nuclear wars, has never been greater. Given the current trajectory, nuclear war actually appears inevitable. Veterans For Peace is committed to opposing U.S. wars, both overt and covert. Our Mission Statement also calls on us to expose the true costs of war, to heal the wounds of war, and to push for the elimination of all nuclear weapons. We want to abolish war once and for all. Last year Veterans For Peace (VFP) dramatically stepped up our efforts to educate people about the dangers of nuclear weapons when we relaunched the historic antinuclear sailboat, the Golden Rule. The 34-foot peace boat was the star of the VFP Convention in San Diego last August, and stopped in ports along the California coast for unique public events. Now the Golden Rule is beginning a 4-1/2 month voyage (June – October) throughout the waterways of Oregon, Washington and British Columbia. The Golden Rule will be sailing for a nuclear-free world and a peaceful, sustainable future. We will make common cause with many people in the Pacific Northwest who are concerned about the devastation of climate change, and are organizing against dangerous coal, oil and natural gas infrastructure in their port towns. We will remind them that the risk of nuclear war is also a threat to the very existence of human civilization. Veterans For Peace will encourage climate justice activists to work also for peace and nuclear disarmament. The peace movement, in turn, will grow as it embraces the movement for climate justice. We will build a profound international movement and work hopefully together for a peaceful, sustainable future for all.